For those who have not heard of or seen Lingaraj College, an interesting experience awaits them when they come and see it. It is this experience that gives the learners in the college, a rare joy which they can hardly forget. Such a compulsion, perhaps, made the people unofficially crown Lingaraj College as the mother of colleges in North Karnataka. 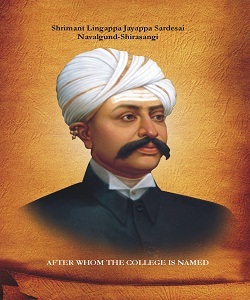 Founded in 1933 with basic aim of giving higher education for the educationally disadvantaged people of the then Bombay Province, the Lingaraj College is imparting an outstanding quality education in and around Karnataka. Because of its pomp and splendor of over seventy years, people respectfully bow their heads to this, 'temple of learning'. It is exciting to hear that many of its admirers often refer to Lingaraj College as a 'Mini-oxford'. Every stone and brick that is used in the monumental building tell the tale of the founders who sacrificed their self-interest in the true tradition of K.L.E. Society. The great souls of Saptarishis and the three patrons, the founders of the K.L.E. Society in 1916, must be feeling satisfied watching from the Heaven that the first college started by them is today a renowned name in the field of conventional education. Thousands of students from all castes, creeds, religions and regions study and go out from its portals with their degrees in Humanities, Commerce and Management courses as fully developed competent human beings. The dedicated members of the staff work from morning till late evening with great commitment to live up to the great tradition of Lingaraj College and that of the K. L. E. Society. Being aware of the difficult task of restoring the past glory and tradition set by Dr.S.C. Nandimath, Prin. G. S. Paramashivayya, Prof. C. S. Bagi, Prof. K. R. Srinivas lyengar, Prof. A. K. Ramanujam, Prof. K. Bhogishayan, Prof. K. C. Wali, Prof. Narayan Sharma, Prof. Halayya, Prof. K. B. Nikumb, Prof. Bhusnurmath, Prof. R. C. Hiremath, Prof. T. Reuben, Barrister Nath Pai, Prin. B. Rudrappa, Prof. V. D. Kulkami and many more stalwarts, members of our staff are striving relentlessly day in and out at least to be somewhere near the glory of those golden years. We, right from menial worker to principal, leave alone teachers, are aware of the modern concept that we are not dealing with pots and pans when we are dealing with our young minds. We, infact, are dealing with delicate, vibrant personalities, if rightly trained, will become powerful personalities, enriched and enabled to build a new India. Right steps are taken, mobilizing the resources at our command, to face-lift and up-date the infrastructure of the college.